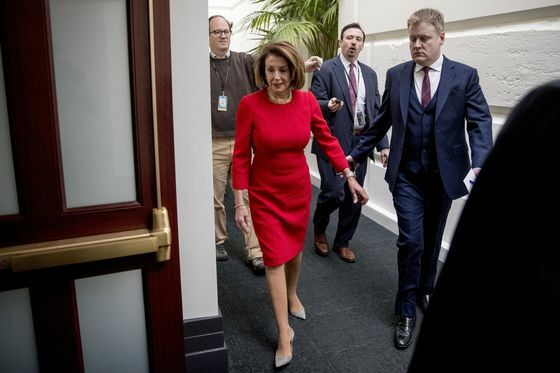 (Bloomberg) -- House Speaker Nancy Pelosi said she won’t let President Donald Trump give his State of the Union address in her chamber unless government agencies have been reopened, a further escalation of the feud between the two leaders. In a letter to Trump on Wednesday, the speaker said that when she invited the president to give the address on Jan. 29, "there was no thought that the government would still be shut down." "I look forward to welcoming you to the House on a mutually agreeable date for this address when government has been opened," said Pelosi, a California Democrat. The president last week denied Pelosi a military plane for an unannounced trip to visit U.S. troops in Afghanistan a day after she suggested a delay in the speech. The running dispute has added to the difficulty of finding a resolution to the partial government shutdown that began on Dec. 22. Trump told reporters at the White House he was "not surprised" by Pelosi’s response. "The State of the Union speech has been canceled by Nancy Pelosi because she doesn’t want to hear the truth," the president said. "We’ll do something in the alternative," Trump said, adding that it’s "sad" that he won’t be giving the speech in the Capitol. Earlier Wednesday, the president sent Pelosi a letter saying he intends to deliver the State of the Union as he was originally invited to do. The Democratic-controlled House and the Republican-controlled Senate must pass a joint resolution to allow Trump to deliver the speech to a joint session of Congress. The House won’t consider such a resolution, Pelosi said in her letter. The resolution is usually a routine formality taken shortly before the event. In suggesting last week that the address be rescheduled, Pelosi cited security concerns because Secret Service agents and Department of Homeland Security staff aren’t being paid during the shutdown. Pelosi accused the Trump administration on Friday of endangering her safety by leaking her plan to take a commercial flight to Afghanistan to visit U.S. troops after the president canceled her use of a military plane. A White House official, who refused to be identified, denied the administration leaked the information about the commercial flight.